We have a wonderful garden, you know? 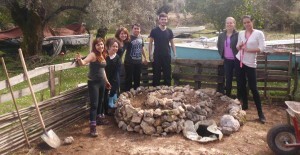 Volunteers of Solidarity Tracks have arrived to the end of the eco-garden workcamp in Nidri. Yesterday the last seedbeds received their new residents, the concluding brush strokes on the veggie indicators were made and, finally, all the rocks found a comfortable place in the spiral of aromatic herbs. Furthermore, we managed to exhaust an entire stock of nails and paint in order to fix the small house at the bottom of the garden, the purpose of which is still foggy for all of us. Obviously, tons of ideas popped up during the workcamp about the aims it can serve: kid’s hut, bear ambuscade, headquarters of a mudwar, birdwatch or shooting (?) place, a sneak peak house or a stage from where you can sing for the vegetables to grow faster. Nevertheless, we might need further brainstorming in order to find the best way to use our colourful house. Moreover, our plants could also use some “rainstorming”, from now on, for growing and getting more beautiful (and tastier, of course). Now let us quickly run through the eco-garden week. We had a kick-off with great hopes for good weather, efficient labour and wonderful results. How was it? Even better than what we hoped for. Saturday morning the sun did not make us blind but atleast it was partially with us while the rain showed complete disinterest in our activity. This resulted in a extremely productive first day. The lunch had to wait for us a little but when we looked around and saw the clean seedbeds, the amount of weed gathered and the mountain of unnecessary elements at the bottom of the field we could easily stop hearing our stomach growling. 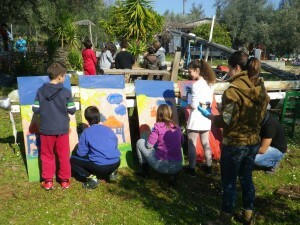 Moreover, the promising beginning of the workcamp triggered an even higher level of enthusiasm for the next day. While each morning our excitement grew, because the garden was coming into being in front of our eyes and under the work of our hands, waking up got more and more difficult. Still, the very fact that we were together gave an indispensable extra vitality to each of us. The last day of the workcamp, when the aromatic herb spiral was already finished and the seedbeds were looking welcoming, we had the opportunity to host a class from the school of Nidri. 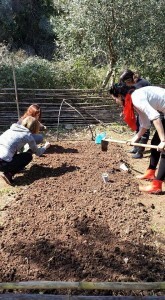 It was a chance for us to charge our batteries with some bliss and for them to have an insight into gardening. The two hours they spent with planting, painting or doing handcrafts was definitely an energy overdose for all of us. Nevertheless, we managed to fulfill, broadly speaking, all the aims planned: the garden is ready to live, the small house is shining in bright colours and all the weeds evicted on the first day were relocated next to the olive tree in order to turn into compost. It was time to put an end to the workcamp, to the 3rd initiative and, thus, to the project itself. Indeed, we closed the week. Still, we did so with some sort of satisfaction. Since without any doubt, the field was alive, it was breathing, it was joyful and bright when we put down the tools. It could not have been more obvious that it was the moment when something was born. Good job Andrea! Congrats to all of us! Χρόνια πολλά,κήπε! 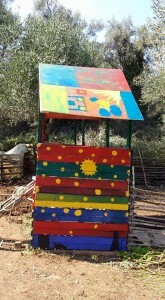 This entry was posted in Local and tagged eco-garden, Nidri, school.. Bookmark the permalink.